The interconnected nature of physical and psychological “knots”. integral theory? ok, i’ll bite: what the heck is it? and what’s up with no photo???? put up something with your nice, clean-shaven face. When I say integral theory, I’m referring to the theory frameworks of American spiritual writer Ken Wilber. Wilber has been piecing together a range of ways of integrating science and spirituality, religion and psychology, sexuality, ecology for over twenty years. In the realm of spirituality, Wilber argues firstly that a fully-rounded path needs to account for individual and collective dimensions, for the reality of both subjective-interior perceptions (for example, visionary experiences) and for objective-exterior information (for example, brain scans of monks having visionary experience). Secondly, he feels that a system of praxis and its supporting theory needs to include training in different states of consciousness in addition to our normal, waking state, especially visionary, subtle states and the deep, formless darkness of the causal states. Third, spiritual teaching, in Wilber’s view, needs to be able to accommodate people at different stages of maturity (James Fowler’s “Stages of Faith” delves into this territory quite nicely) and not to restrict itself to just preaching a traditionalist form of belief. There’s a bunch of other aspects to Wilber’s theory, but one of the other key parts in my view is a notion that he adapts from gestalt psychology’s adaptation of Jung: The Shadow – the denied aspects of the self. Only a spiritual path that acknowledges the Shadow and has practices to work with it can avoid “making a religion of our better moments”, allowing us the possibility of acknowledging, surfacing and integrating our shame and darkness. There’s lots more. If you’re interested, pick up Wilber’s “Integral Spirituality” or “Integral Psychology”. I’ll probably delve more into some of this in later blog entries. I’m mucking around with [tumblr](http://www.tumblr.com) by creating a tumblelog for my ongoing reading related to my various non-IT interests – particularly an integral take on organisations and on Gnosticism. It’s called [Resonance](http://resonance.tumblr.com), it’s got a feed. Please feel welcome. After a long illness, Robert Anton Wilson, died on January 11. Various people, [R. U. Sirius](http://www.10zenmonkeys.com/2007/01/11/robert-anton-wilson-1932-2007/), [Fr. Jordan+](http://egina2.blogspot.com/2007/01/remembering-bob-wilson.html), [Bro. Jeremy](http://www.snant.com/fp/archives/rip-robert-anton-wilson-raw/), [Bill Harryman](http://integral-options.blogspot.com/2007/01/speedlinking-11207.html) (from whom I got the news), [lvx23](http://www.lvx23.com/weblog/archives/2007/01/robert_anton_wi_1.html) and I’m certain [many others](http://blogsearch.google.com/blogsearch?hl=en&q=robert+anton+wilson&btnG=Search+Blogs) offer tributes both short and long. I read “The Illuminatus! Trilogy” when I was 18… Bob is almost single-handedly responsible for the odd shapes that remain embedded in the interior of my cranium to this day. Thanks to Bob, I’d read [Leary](http://www.leary.com/) talking about LSD as a sacrament *before* I got drunk for the first time. He led me to [Korzybski](http://en.wikipedia.org/wiki/Alfred_Korzybski) and to [Crowley](http://en.wikipedia.org/wiki/Aleister_Crowley), Bob was my first spiritual teacher. He was an original. The world is a slightly smaller and much sadder place without him. 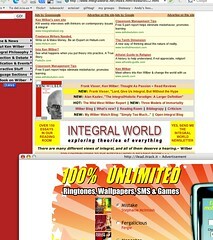 I’m pretty sure that Frank Visser’s [Integral World](http://www.integralworld.net) site has pop-up ads. Every time I go there, I get a pop-up – when I go back or reload, I can’t replicate it, but it seems to keep happening. I’m sympathetic for the need for revenue to keep a big project like that going, or even to make it seem worthwhile, but… Pop-ups?? That plus the irritating frames layout are making it less and less pleasant to visit. Gnostic + Orthodox + Development = Integral Christian? Forgive me for the following set of mismatched ideas that landed on me while drowsing this morning that I just wanted to get out. It makes me wonder if rather than thinking of gnostic and orthodox as distinct traditions, it makes more sense to see them each as as threads that only make sense in a larger cloth, so that if either takes hold too long, the other bubbles up to match it. The history of orthodoxy and heresy obviously only seems to make sense in reference to each other. To draw in a bit of framing, the gnostics emphasize the personal relationship with the Divine, the mystic initiation, epiphany to gnosis while the orthodox put greater emphasis on belief, community, family, conformity… agency versus communion. One could look at that polarity as Freedom (acquainting oneself first-hand with the Ground, with the sound of [Bythos](http://en.wikipedia.org/wiki/Bythos)) versus Fullness (stepping forward into life and discovering what the meaning of the Gospel is for “the householder” as [Gautama](http://en.wikipedia.org/wiki/Tathagata) might have said). And look, I’m not saying there’s no contemplation in the orthodox traditions (there certainly is) and I’m not saying Gnostics don’t love their families :)… I’m just noticing emphases that are only apparent when you see the dance and you watch the difference in the steps taken. Gnosticism adds handy stuff to orthodox theologies, it gives us the notion of the [Demiurge](http://en.wikipedia.org/wiki/Demiurge#Gnosticism) – the chief Archon who rules over the world he created and who desires that we never notice that we are trapped. The Fullness, the Pleroma, Bythos are all names for the indescribable, unknowable Suchness of the Divine from whom emanated all things, including (via a fairly complex path) the Demiurge and to whom we long to return. Any of us raised in orthodox traditions are familiar with hearing the G-d is unknowable, yet we spend most of our time in religion hearing all about Him, His various wishes and desires, His laws, His actions. We end up feeling we have a pretty good idea who G-d is – but a Gnostic might argue that what we’ve ended up only making friends with the Demiurge. If we take the basic developmental sequence popularized by [Spiral Dynamics](http://www.spiraldynamics.com/) and [Wilber’s](http://www.kenwilber.com/) notion (from [Whitehead](http://en.wikipedia.org/wiki/Process_philosophy#Whitehead.27s_Process_and_Reality)) of the “creative advance into novelty” might we notice that what, at one point in history, might manifest as almost unspeakable, ecstatic freedom from the iron prison of the current conditions (the rule of The Law overcoming the horror of endless conflict, for example), might seem later to be itself an iron prison (the stultifying rulebook of The Law holding back individual creativity based in rational ethics)? Is the Christos a child who grows up to be a grumpy old Demiurge? And what of [Her](http://egina2.blogspot.com/2006/10/shhhh.html)? It doesn’t seem to matter how much the orthodoxy tries to leave Her out or reduce Her role, She [keeps](http://www.magdalene.org/) [knocking](http://www.imdb.com/title/tt0382625/) at the [the door](http://www.youtube.com/watch?v=2nmFg7hZRv4). What might the Christian tradition look like if we took the orthodox and the gnostic freely as paired gifts of our history and reflected (via scripture if you’d like, via history if you’d rather, via introspection if you’re able) on that very history and the emergence of higher, freer, fuller notions of who we are to be together and of how we are to see and hear G-d? Why it just might look like something a little less embarrassing than most of what passes for the Christian tradition now. Something useful and gorgeous and true. But like I said. Just some drowsy ideas borne of undisciplined reading… your mileage may vary, exercise due caution.